The skull has numerous holes (foramina) through which various cranial nerves, arteries, veins and other structures pass. 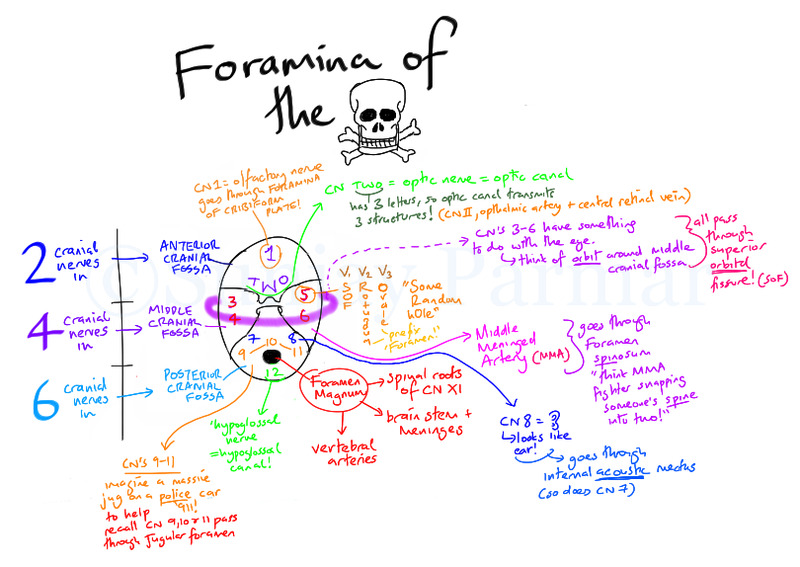 To aid learning of these important foramina, I have created this visual mnemonic. This is ridiculously helpful! Thank you so much. I wish I'd had this in my day! Many thanks - just made life so much simpler!! seriously..where dd u study this? - A simplified drawing for the diseases of liver and gallbladder. Hope it helps! - Babies whose skulls become deformed from lying in the same position for long periods do not benefit from wearing a corrective helmet, a study has found. - Vocabulary words for F-IAT Skull and Cranial Nerves. Includes studying games and tools such as flashcards. - An overview of clinical back pain, looking at common aetiology and methods of avoiding reinjury. - A concise mindmap detailing everything you really need to know about antibiotic action! - A mindmap of some key principles of immunology I made for revision purposes. Nothing too complicated (hopefully)! - An incredible diagram on bacteriology. Remember a lot of hard details quickly and easily! - Useful chart explaining glands and hormones! - A clear illustration of immunodeficiency disorders. - An image of both the intrinsic and extrinsic pathways of the clotting cascade including the interactions between the two and other finer details.